I look forward each month to Garden Bloggers Bloom Day. 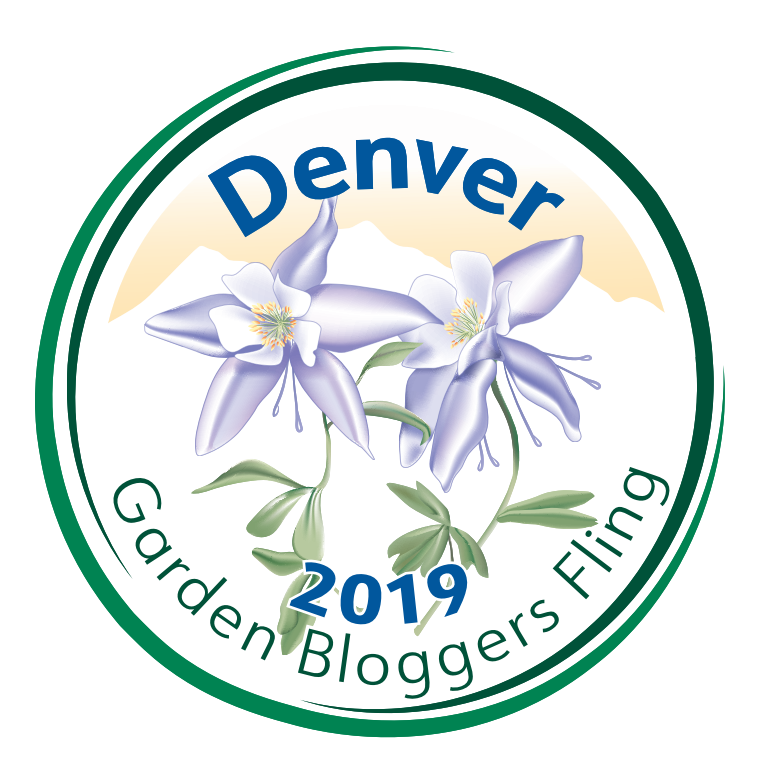 Bloggers from around the country post what is blooming in their garden. Here in Houston Heights (zone 9a) it is a warm and sunny day as I write this. The doors are open the a gentle breeze is blowing. This is the time of year I love living here. Too chilly for most of the mosquitoes and warm enough that you don’t even need a sweater. My favorite flower this time of year is the Yuletide Camellias. 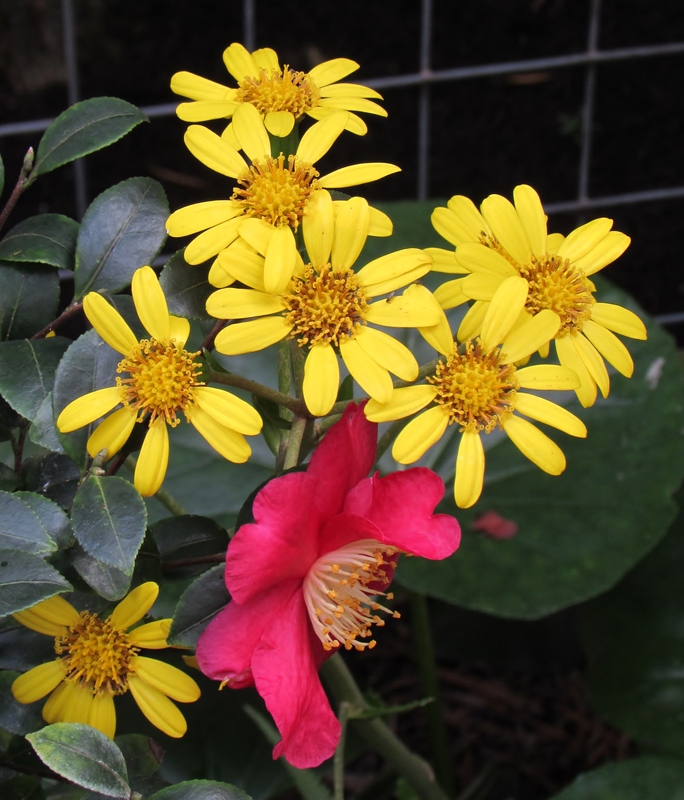 I blogged about them for GBBD last month and they are still blooming : ) Below is a picture with bright yellow daisy like flowers from our Giant ligularia, Ligularia tussilaginea ‘Gigantea’. I think they are fun combined with the Yuletide blooms. -In the background you can see the big tractor-seat shaped ligularia leaves. Some of my blooms are indoors. Here is a bowl of Paper whites narcissus. Their scent is strong and greets me each morning as I come downstairs to the kitchen. I have them outside too but they will not bloom for another couple of months. 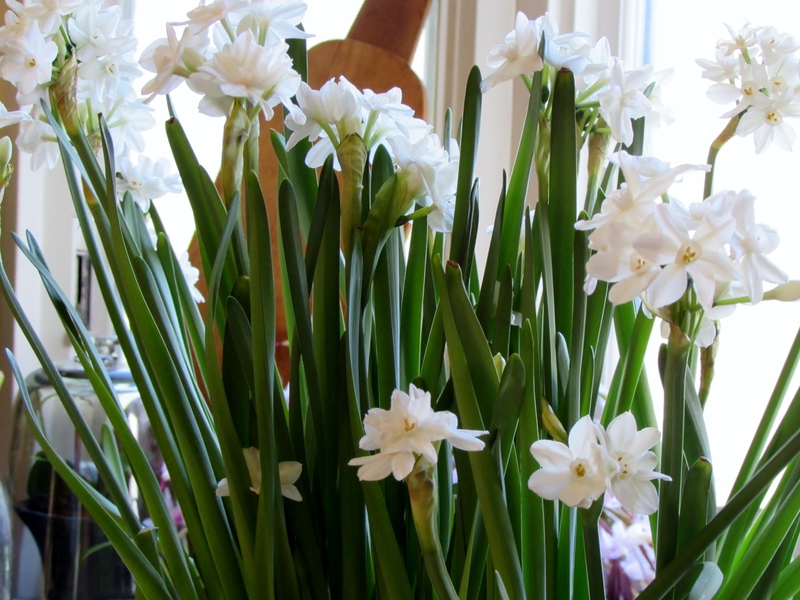 -Narcissus also called paper whites. This is my greenhouse window where I have my little indoor garden. The Christmas Cactus is blooming right on cue. 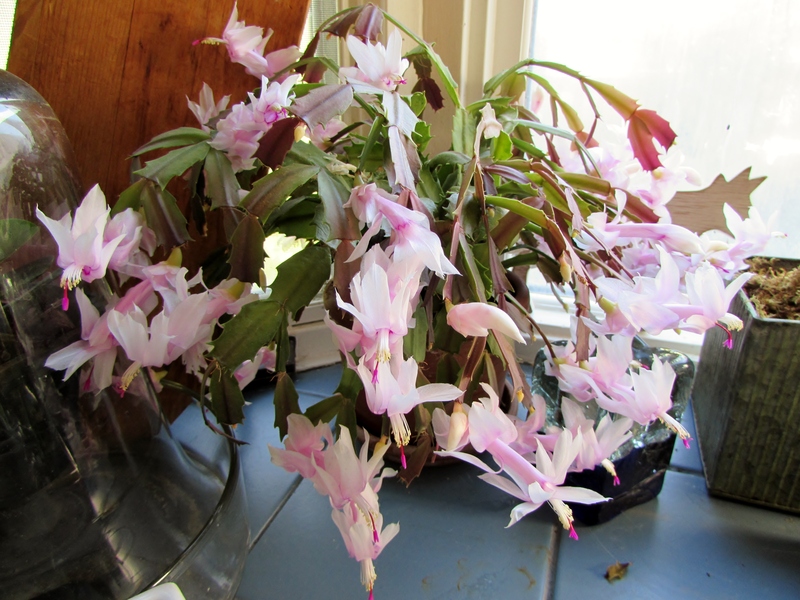 The botanical name is Schlumbergera or Zygocactus). It is so cheerful on the days when the sky is overcast. Today it is so bright I almost couldn’t take a picture. 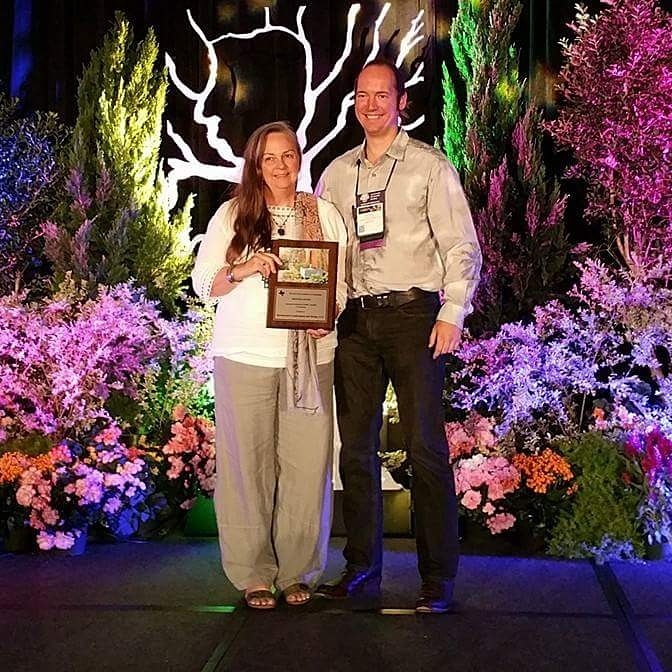 Here is a link to a great little article on growing and caring for them. 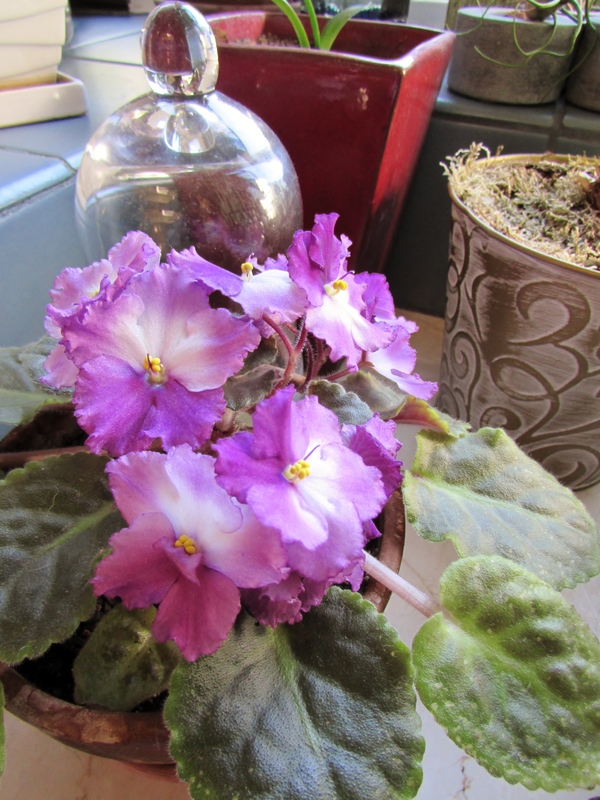 And the African violet is still holding on to its blooms too! I was hoping the amaryllis I ordered would be blooming for Christmas but alas they got lost in the mail and are just barely two inches tall! Back outside we have our big urns filled with poinsettias. I only half buried the pots because if we get a cold snap I will bring them inside. I was going to replace the purple potato vine that we planted to put around our pumpkins for Halloween but decided it looked interesting with these usual colored poinsettias. We actually have a neighbor with a 15 foot tall poinsettia that is growing in the ground. It must have a good root system. It gets frost damage but manages to survive. -You can see what a lovely sunny day it is! In the back ground the lawn is bright green with the newly seeded rye grass. Poinsettia plants are native to Mexico, where they can grow up to 16 feet tall. It is very popular to use poinsettia as Christmas decorations. 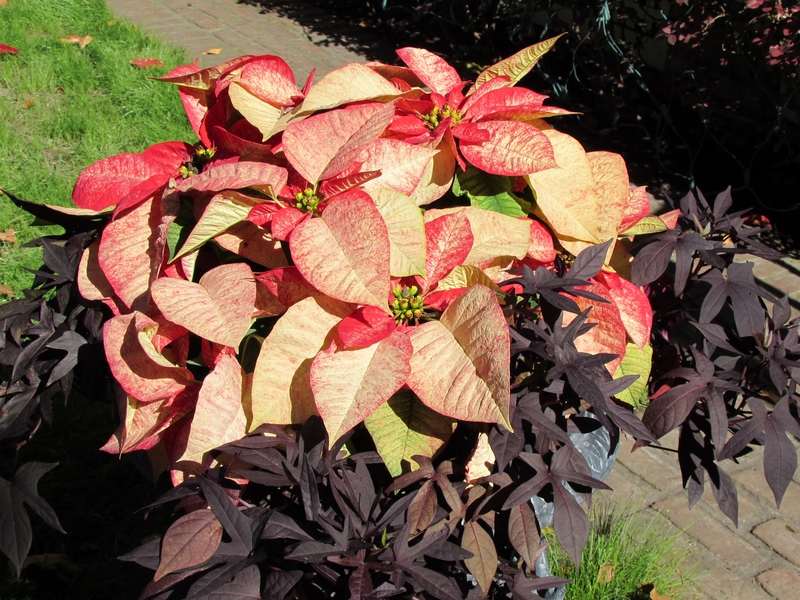 If you live in a place with mild winters, you can plant the poinsettia outside as a perennial. I grew up in San Diego and I remember seeing them growing in peoples gardens. They can also be grown as houseplants year round. Actually the bracts which are traditionally red also come in many other colors. They are often mistaken for flowers petal because of how they are grouped but they are actually leaves. 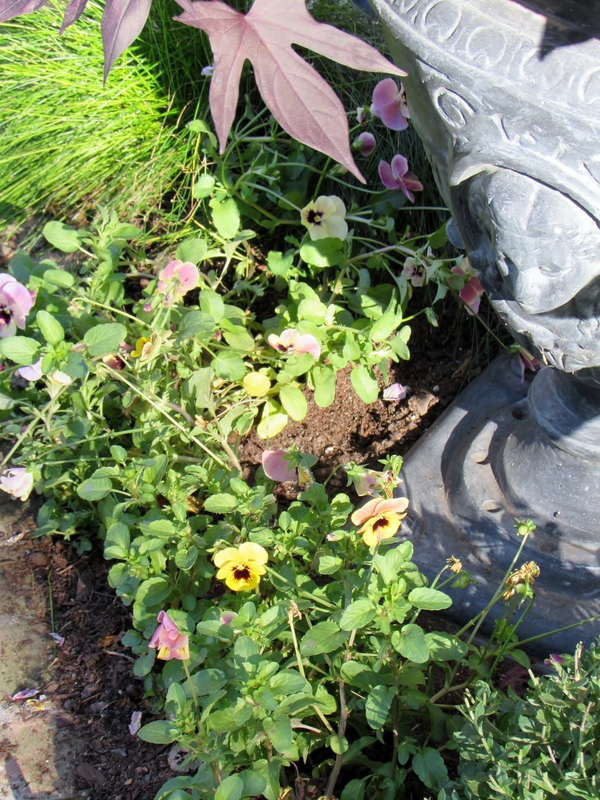 Below the urns are some small pansies that are looking pretty with their fancy faces! 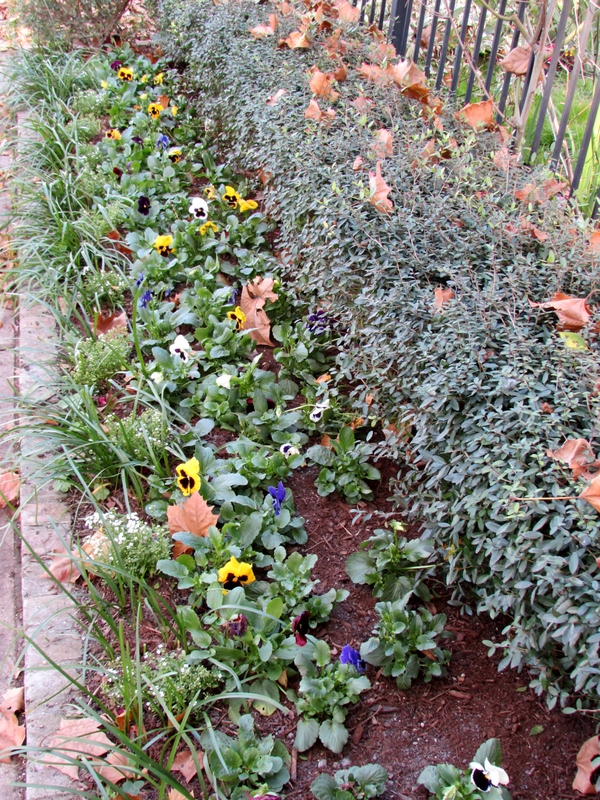 Here is our front annual bed with newly added pansies and alyssum. The pansies got planted late this year but they are filling in nicely.They are nestled between the dwarf yaupon hedge and the Fairy lilies, Zephyranthes candida border. Last year they lasted until April because the cold weather stayed on so long. We can not seem to keep up with the loads of leaves the American sycamore are raining down on us! 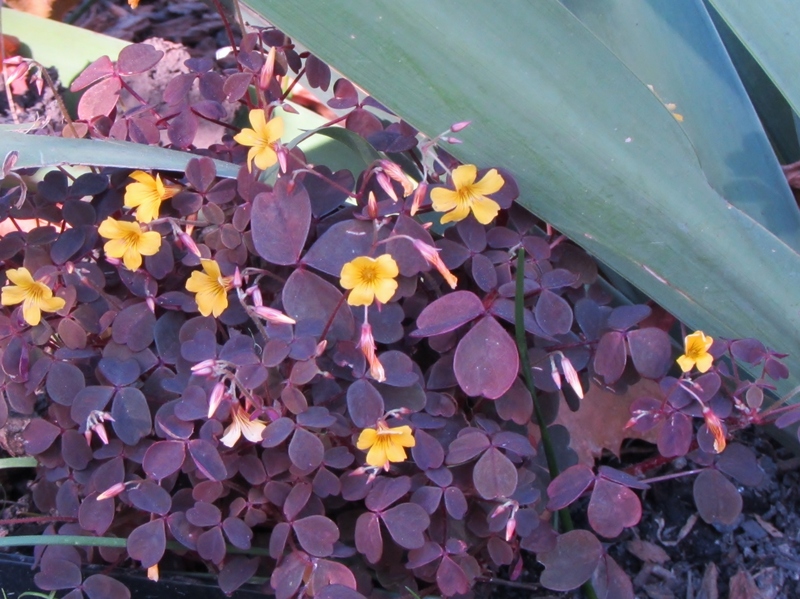 We found these very cool oxalis called Burgundy Bliss Shamrock, Oxalis vulcanicola ‘Burgundy Bliss’ recently and I planted them as a border to the Giant Walking Iris. Just for fun! I think it probably sounds funnier than it looks, tiny oxalis and giant irises : ) Do love the color of these! 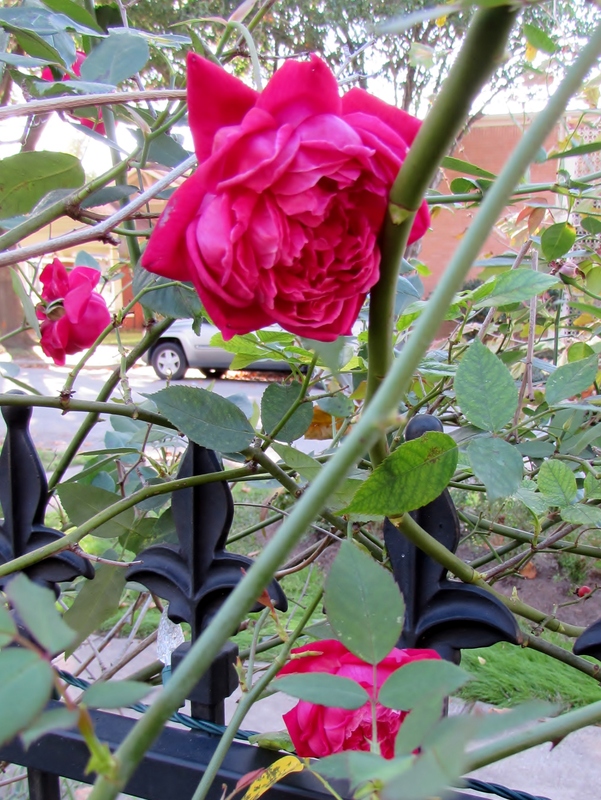 On the wrought iron fence the Dr. Huey rambling rose has come back to life. They really don’t like our hot humid summers. Happy Gardening! 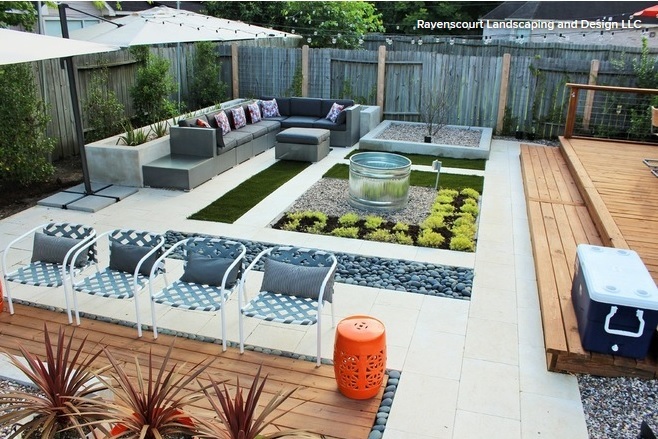 I like the effect of the Poincettia with an edging of the purple potato vine. And you have that gorgeous Camellia Yuletide. I keep seeing it on blogs and I am talking myself into buying one. Thank you Chloris. Your garden is looking lovely, i enjoyed the pictures this morning! I have always wanted an Abutilon. I have used them in designs but mean to get one here. And the Yuletide is really an awesome bush! Oh, to be able to grow Poinsettias outside! I should be so lucky… But I’m completely with you on the Yuletide. Such a wonderful plant! Merry Christmas, Laurin! Merry Christmas to you Anna : ) I do know each climate has its pluses and minuses. Some are more changes that others. Ah! Where gardening and photography meet… What can I say more? 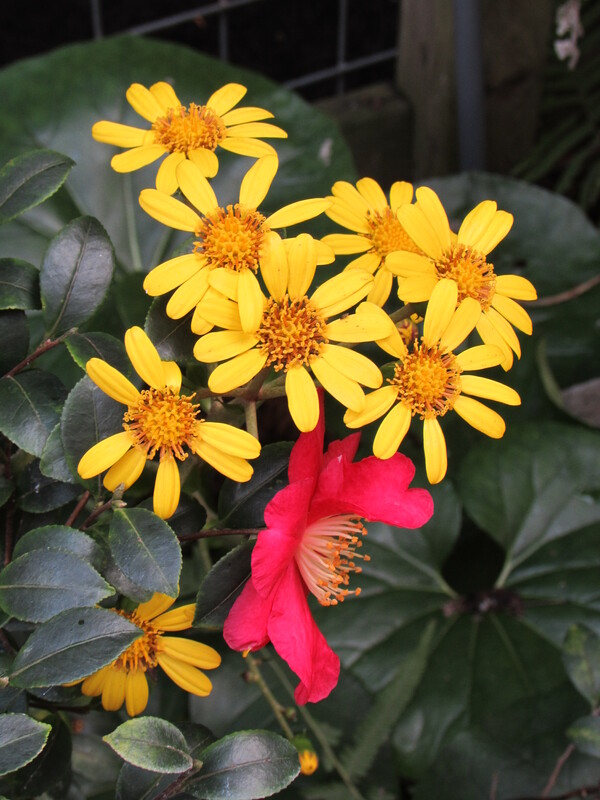 It is fun to take pictures in the garden. I think it helps me be more observant! Purple in the garden really sets off the paler shades. Your poinsettia planting with the potato vine is stunning. Your Christmas Cactus made a stunning display. Thank you Nell : ) I do love purples and burgundy as accents.